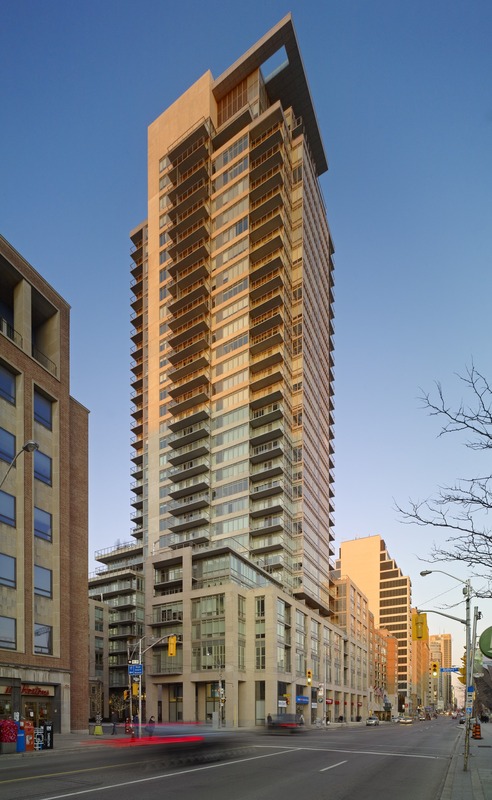 One Bedford is a high-end residential development bordering the Annex, one of Toronto’s upscale 19th century neighbourhoods. The transition from the heritage neighbourhood to the north, to the busier, retail/institutional Bloor Street precinct to the south is mitigated by an eight-storey limestone-clad base articulated as a stone frame with large windows. On Bloor Street, the base forms a continuous urban street-wall activated with retail uses. The main entrance on Bedford Avenue features a garden forecourt. The lower north tower is a lighter, glass building that mediates between the base and the taller Bloor Street point-tower. The exterior expression resonates with the primarily masonry character of the Annex neighbourhood. A projecting bay window floats above Bloor Street capturing dramatic east and west views. Units in the towers are distinguished with views toward the north and south.